With ever increasing varieties Wholesale Crowea plants are being offered in improved flowering forms by growers in most states. 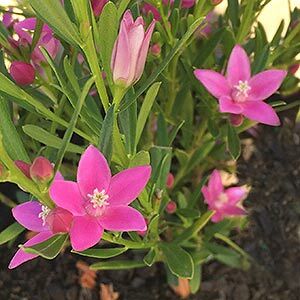 Crowea are a group of Australian native plants with wholesale Crowea nurseries offering a range of selected varieties for landscaping as well as cut flower growing. Species and cultivars differ in flower colour as well as height. The most widely offered varieties are C. exalta, C. saligna and C. angustifolia. However it it the named hybrids that perform best in garden conditions and are used by landscapers. The low growing types are well suited for use in rock gardens and close to the front of the garden border. C. saligna is known as the ‘Willow Leafed Crowea’. Reaching around 1m in height, narrow willow like foliage that takes well to light pruning after flowering. All species are great for cut flowers. Most flower over a period of 2 – 3 months in autumn and bring good colour to the garden. Pruning – Tip rune to maintain shape. Frost tolerance – Best in frost free locations. Landscaping Uses – General garden use, mass planting. Flowering Period – Late spring through summer to autumn, main flush in summer. Water requirements – Extra water during dry summer periods. Fertilizer requirements – Low phosphate native plant fertiliser applied in spring when soil is moist. Climate – Suited best to Temperate to Cool climates. C. Poorinda Ecstasy – Waxy pink flowers and bright green foliage. Reaches around 1m in height. C. Rhapsody – Deeper pink flowers, excellent feature plant. C. Edna Walling – Pale pink to mauve flowers, more of a spreading ground cover in growth habit, will reach .5m in height with a 1m spread. Named after the landscaper. Tried and true variety. Wholesale Crowea plants are available from the following growers.